This article will teach you how to prune a flowering tree. Many flowering trees require little if any pruning, though it may be desirable or necessary to remove stray, broken or dead branches to improve tree structure and vigor. Major pruning of flowering trees should be performed during winter when the tree is totally dormant or immediately after flowering, although some trees will ooze liquid if cut too close to the time of spring growth. One period to avoid is when buds are expanding in the spring. Pruning during this period can disrupt tree growth and stress trees badly. Because each cut has the potential to change the growth of, or cause damage to a tree, no major branch should be removed without a reason. Be careful how many limbs you remove from any tree. Removing limbs is removing foliage. Removing to much foliage from a tree has two distinct effects on its growth. Removing leaves reduces photosynthesis and may reduce overall growth. That is why pruning should always be performed sparingly. Overpruning is extremely harmful because without enough leaves, a tree cannot gather and process enough sunlight to survive. CAUTION: Flowering trees should never be topped as removing the central leader will destroy the natural shape and structure of the tree. Major Pruning: When doing major pruning, prune limbs just outside the base of every branch at a point called the "branch-bark ridge". The branch-bark ridge is where the growing, expanding branch and the expanding trunk push up bark between them, looking like caulk, so to speak. If the bark ridge is squeezed up and out of the crotch, there is a corky or a raised ridge. Sometimes the bark is not squeezed up and out of the crotch; the expanding branch and trunk have grown around it and "included" it. The bark ridge is a crack or slit in this case. On the bottom side of every branch where it meets the trunk or another main branch of the tree is the "branch collar". 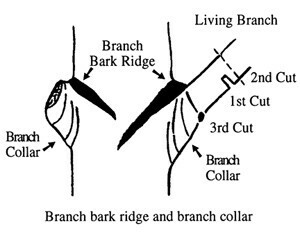 Make sure your cut is beyond the branch collar, and the branch ridge at the top of the limb.DO NOTcut into branch ridge or branch collar! Do not use wound paint or tar after making a cut. TIP: If you have any reservations about pruning your tree call a local arborist. (Heavily advised). Pruning mature trees may require special equipment, training, and expertise. If the pruning work requires climbing, the use of a chain or hand saw, or the removal of large limbs, then using personal safety equipment, such as protective eyewear and hearing protection, is a must. Arborists can provide a variety of services to assist in performing the job safely and reducing risk of personal injury and damage to your property. They also are able to determine which type of pruning is necessary to maintain or improve the health, appearance, and safety of your trees. Minor Pruning: Minor pruning of stray or crossing branches can be performed using a method similar to 'major' pruning above. Be careful when cutting any branch from a tree to make sure that removal will not adversely effect the shape or look of the tree. The only other time it’s good to prune a flowering tree is when you notice a dead or diseased branch. It’s important that you get these branches as soon as possible to stop the spread of disease and to allow the plant to use its energy on growing instead of healing.